While Galatasaray don’t have a fantastic record this season, standing with a 3-8 record, they have won their last three home games. This is why the Istanbul side will have some confidence behind them when they come into this Euroleague clash with the Italians. Milan come to Turkey with a 4-7 record and having suffered four defeats in a row, Milan will be feeling rather low. It has been a grim season so far for Galatasaray but there is no doubt that home comforts can lift the spirits. Justin Dentmon has been a key player so far this season and he has offered an average of 12.3 points per game. Sinan Guler has also been instrumental in the good things that Galatasaray have offered and he has provided an average of 10.5 points per game and an average of 5.3 assists per game. Vladimir Micov has also chipped in with an average of 9.5 points per game and if these players offer something on Friday night, the home fans may be happy again. Things looked so good for Milan earlier on in the season but they have endured a terrible time of late. Falling to a 4-7 record has dented their hopes for the season and they really need to snap out of this losing streak before too long. They have the players who can propel them to victory and if Rakim Sanders, with an average of 13.1 points per game and Ricky Hickman, with an average of 10.6 points per game, can step up, Milan will have a chance of taking this game. Milan have an average of 82.6 points on the road which is the third highest scoring record for an away team this season so the Italians know they can score points in this match. 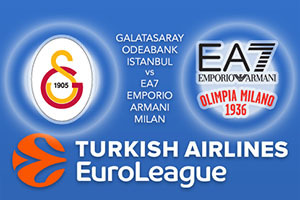 The bookies think the hosts will take this game so consider EA7 Emporio Armani Milan at +3, available at odds of 1.90. When it comes to the Over/Under market, go UNDER 165.5 at odds of 1.90. Bet Now!